The title says it all. Made for a commission, the committent agreed them to be released here under CC0, so here they are. The tiles are sized 16x16. I love it. Colors are so beautiful. Makes me want to save Hyrule. this is great, I really like it! thanks! Thanks a lot for this. I love the CC0 license, but you could have chosen the CC-BY license to make sure people give credit where it is due. I will give credit, anyway. It's the honor system. Haha. I would gladly pay for a bigger art set! 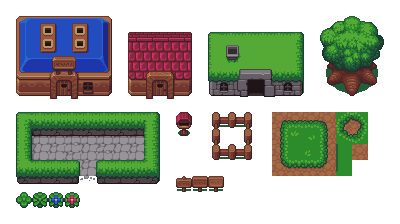 Hey I just wanted you to know that I really love the style of this tileset and went ahead and added some things to it. If you would like to use them feel 100% free to add them to the original download. No credit to me need at all. 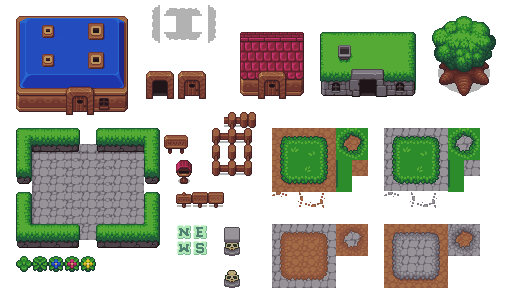 My version is more geared to work with Tiled and so shadows are semi-transparent so they can be used over any object. 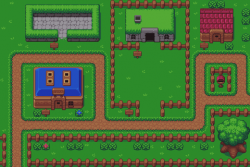 I wanted to add things like cliffs and waterfalls but I am not very good at pixel art and when I atempted to make them, they did not look very good. If you or anyone else can add them, would be awesome. nice!! it looks like poketmonster~!! Really cool! Could you share your palette? That's be so awesome! EDIT: If you don't mid, I have extracted it. I just wanted to say that I used your tilesets for 3 of 4 level backgrounds in Garden Warden: https://mnilsson.itch.io/garden-warden . This one, as well as the floating islands tileset and the dungeon tileset. So you contributed a very great deal to the game; thanks!